One of the hardest parts about being alive is that sometimes you simultaneously need to update your wardrobe (fall is like, here, almost!) and do brunch with yo' pals. Spicy Blood Mary's and new shoes: never the twain shall meet. Until now. 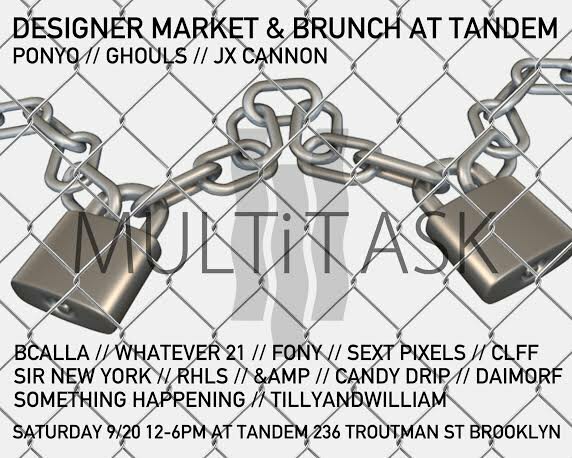 Starting this Saturday, September 20th, and recurring on subsequent Saturdays on a monthly basis, Whatever 21 and MOVES, two longtime contributors to Brooklyn's underground music scene and independent clothing movement, will be bringing you Multitask, a unique hybrid brunch and shopping event held at Tandem Bar. While you wait for a table or for your food to arrive, pop into the back room for a looksee. With the fog machine and the laser lights turned off, the space will reveal the work of a mix of young designers debuting their first collections and established independent Bushwick clothing designers. Also stock up on accessories and zines! No post-Labor Day ensemble is complete without a copy of a local zine. TILLYandWILLIAM pieces will be for sale, all for under $100. Expect to find these designers there: BCALLA, CLFF, Sext Pixels, Whatever 21, Fashion Origins New York, Ruffeo Hearts Lil Snotty, Daimorf, TILLYandWILLIAM, &amp, Something Happening Shop, Candy Drip and Sir New York. The designers showcased are normally quite hard to find because they produce small runs and disappear quickly at stores. Plus, naturally, DJ's will be rocking your brunch shopping heart out, and Tandem will be dishing out their fine, fine entrees plus mmm grits. These shorts can literally toggle up and down your legs. Perfect for those weird days when it's cold in the morning and blisteringly hot by 2 PM. Can't make it this Saturday? Don't worry, they'll be back at Tandem on October 18th and November 22nd. Multitask will take place at 236 Troutman St from 12 noon to 6 PM tomorrow Saturday afternoon.